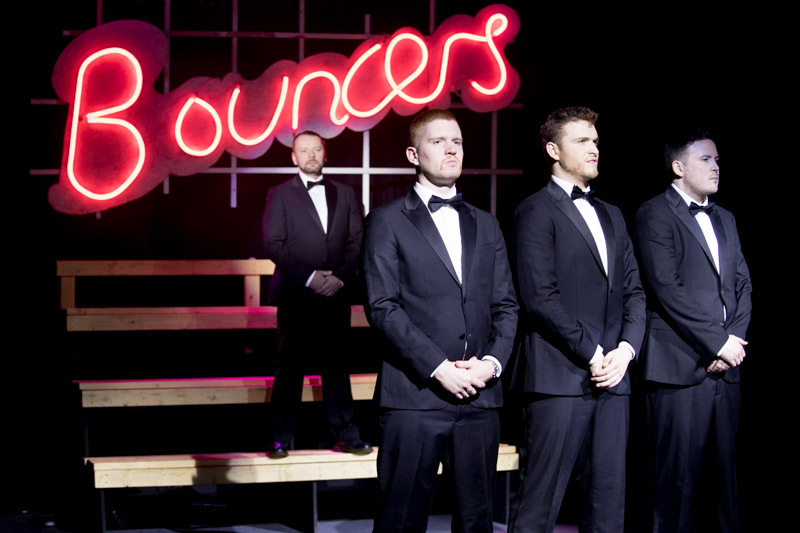 We Are Chester editor Angela Ferguson went along to the Forum Studio Theatre in Chester to watch Tip Top Productions’s latest offering – John Godber’s classic Bouncers. I’m not convinced about the new security staff at the Forum Studio Theatre. They’re not the most welcoming of folk and seem to do a fine line in menacing stares and angry posturing. That said, if you get the chance then you should definitely go along and meet the Bouncers for yourself. Tip Top‘s latest staging, which includes a wonderful slice of immersive theatre before the show even starts, is an experience that is not to be missed. We are so lucky to have such talent in Chester. Tip Top founder and director Peter Swingler OBE modestly states that 90 per cent of the challenge of directing is to get the right cast in place and he has certainly succeeded here, even if we feel he is being far too modest. Judd (Des Hinks), Lucky Eric (Neil Mason), Les (Theo Spofforth) and Ralph (Robert Tempest) do a superb job of capturing and holding the audience’s attention throughout the performance. They are a force to be reckoned with as they fill the stage with their commanding presence. It’s a demanding role and I imagine the actors will be wanting to put their feet up after the run ends on Saturday evening. Think multiple roles, along with some testing choreography and a bit of singing thrown in and you get the picture. This is a performance that the whole Tip Top team should be hugely proud of. It’s a night of thought provoking moments, along with raucous laughter, as we journey with the Bouncers through the course of a big night out centring around Mr Cinders nightclub. The moody men in black suits leave us at times gasping and then laughing in equal measure, with their wry conversations and occasional insightful commentary on the darker sides of our night life culture. The talented actors also turn their hand to portraying a group of giggling women, in addition to four men out on the pull. Also thrown into the mix is a spell at radio presenting, a few stints at nightclub DJing and a rocking rendition of Rapper’s Delight. In fact, there are regular musical interludes, with our energetic Bouncers cutting some mean shapes on the dance floor, guided by choreographer Rob Stevens, and even turning their hand to singing. There are heartfelt moments, when we hear the thoughts and observations of not so Lucky Eric. The cast have real chemistry and you can see how much they enjoy getting their teeth into such a role. It’s a performance that is not to be missed. Catch it while you can. Tip Top are a talented organisation. And, to use a phrase likely uttered by Lucky Eric and pals, you’d be chuffin’ annoyed to miss out. So make sure your name is on the door and that you are coming in – to meet the Bouncers.